Party card games are pretty cool, but some can sort of feel like the same thing over and over again. Sometimes that's alright, but sometimes you want to change things up a little. 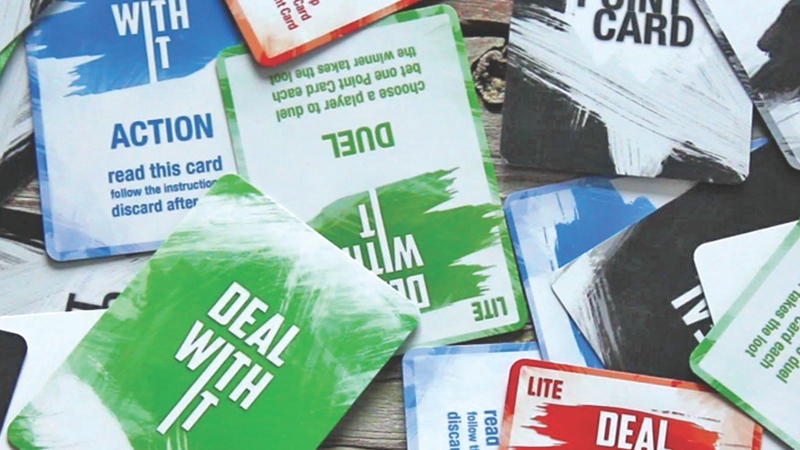 Deal with it LITE is a party card game that's always changing, having people do all sorts of different things in the attempt to gain points. The game is up on Kickstarter now. In the game, players will draw cards from one of two decks. The different types of cards in the decks will have players doing all sorts of different activities. Either they'll duel against other players in some sort of battle of wits, or it will be a sort of physical challenge like trying to make people laugh by using a funny face, or it might involve saying things about yourself and letting others guess which is a lie. All that and then there's rules cards that can change how you have to act during your turn. And that's all in phase 1. In phase 2, the loser of phase 1 is given a choice of horrible options. If they pick the horrible option you gave them (you being one of the non-loser players), then you score a point. Get to 3 and you've won. The game is up on Kickstarter now and is set to go for another 37 days.